Press TV- Iranian President Hassan Rouhani says the United States will make a “big strategic mistake” if it decides to pull out of the 2015 multilateral agreement on Tehran’s nuclear program. He emphasized that Iran has never violated its commitments under the JCPOA and expressed hope the nuclear deal would remain solid and turn into an appropriate model of solving regional and international issues. Rouhani said Iran would not be the first to violate the landmark accord, but added that it has appropriate plans should the US move to exit the JCPOA. Iran and the five permanent members of the United Nations Security Council – the United States, France, Britain, Russia and China – plus Germany signed the nuclear agreement on July 14, 2015 and started implementing it on January 16, 2016. US President Donald Trump has repeatedly described the JCPOA, which was negotiated under his predecessor Barack Obama, as “the worst and most one-sided transaction Washington has ever entered into,” a characterization he often used during his presidential campaign, and threatened to tear it up. The American head of state has repeatedly claimed that Iran’s missile program is in violation of United Nations Security Council Resolution 2231, which endorses the JCPOA. Trump has also complained that the JCPOA-related restrictions have an expiration date and that underscores the need to toughen the “embarrassing” deal. A senior Iranian official also on Saturday reiterated the Islamic Republic’s “legitimate” right to use missiles for its defense, saying the country does not need permission from any state to bolster its missile program. A senior Iranian official says the Islamic Republic does not need permission from anyone to bolster its missile program. “The Islamic Republic of Iran will not seek anybody’s permission to develop its missile capabilities and will use missiles in any way and quantity it deems necessary, and this is a legitimate right of Iran,” Ali Akbar Velayati, a senior adviser to Leader of the Islamic Revolution Ayatollah Seyyed Ali Khamenei on international affairs, said. Secretary of Iran’s Supreme National Security Council (SNSC) Ali Shamkhani also told Iran’s Arabic-language Al-Alam news channel in an interview last month that the idea of making revisions to the JCPOA is brazen, stressing that the suggestion is a mere delusion entertained by Trump. A senior Iranian official says the idea of making revisions to the JCPOA is a delusion of the US president. Shamkhani said Washington’s recent attempts to jeopardize the nuclear accord were illegal, adding that there is no possibility of renegotiating the JCPOA under any circumstances. Rouhani also said Iran enjoys high security and rich energy resources, adding that the country welcomes foreign investment in various sectors, including oil, gas and petrochemistry. 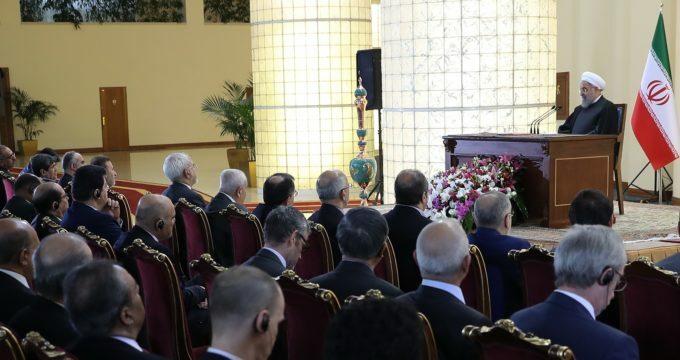 The Iranian president noted that the country has played a very active role in repelling threats against the region, including terrorism and separatism, in recent years and urged the settlement of regional crises only through political approaches. “The military solution and foreign intervention as well as the flow of arms are not an appropriate solution to problems,” he said. He expressed the Islamic Republic’s readiness to play a more active role to restore stability and security to the region in cooperation with all countries. Iran has been providing military advisory support to Syria as well as Iraq in their campaign against terrorism at the request of the two countries’ governments. A senior Iranian official said in January that Iranian military advisory forces entered Syria at the request of the Syrian government and would leave the Arab country after the success of the fight against terrorism. A senior Iranian official says Iranian military advisory forces will remain in Syria until the success of the fight against terrorism.